Blustery spring winds signal the change of seasons in Beijing. 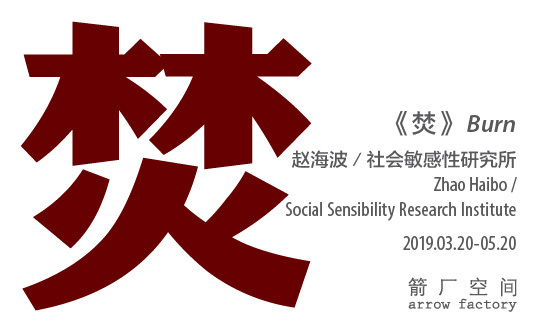 To fortify against the remaining gusts of frigid air, Arrow Factory is pleased to present Burn, a new installation by Zhao Haibo and the Social Sensibility Research Institute (SSRI). Burn features a semi-abstracted photo of glowing embers displayed as an illuminated lightbox, which burns bright and then fades in slow regular cycles. Zhao Haibo’s innovative perspective and intimate treatment of a pile of charred corn cobs is as much an expression of home and hearth as it is an articulation of quiet resilience. Zhao Haibo’s sentiment of perseverance is echoed in the the hutong surroundings where daily life continues behind the onerous grey walls blanketing the city center. Zhao Haibo’s striking photo is framed to resemble a floating planet, or the view from a microscope, the abstraction offering simultaneously both micro and macro possibilities. In conjunction with the window display, anonymous postcards of the image are left in random locations throughout the neighborhood — a re-occurring spark, asserting itself like a small exclamation mark in the hutongs. Zhao Haibo is from a small village in Qiqihar where he grew up working the fields. In 2016 he came to Beijing and found employment at Bernard Controls — a mid-sized actuator factory in the south of Beijing. Bernard Controls not only produces valves, but is also host to the Social Sensibility Research Institute and the LIVE/WORK project, a remarkable initiative run by artists Alessandro Rolandi and Tianji Zhao. SSRI invites artists to spend extended time in, among and with the employees at the Bernard Controls production facility and the company allows creative work to happen on site at their factory. SSRI began in 2010 as an unpaid and unstructured nine-month experiment. Rolandi formally established the initiative with the CEO of Bernard Controls, Guillaume Bernard, in 2011 as an innovative program of worker engagement paired with social art practice. SSRI’s LIVE/WORK project centers on individual conversations about the relationships between work and life, and aims to develop these exchanges into larger ideas incorporating contemporary and modern artists' works. Rolandi and Tianji Zhao accompany employees from the factory from all different levels (worker, manager, etc.) who are interested to create their own artworks. When Zhao Haibo arrived at Bernard Controls, there was little engagement with Rolandi and Tianji Zhao. Their interactions began as short chats during break times. Slowly, it grew into the exchange of art books and naturally blossomed into conversations about the ideas contained therein. Zhao Haibo had an innate sense about the images and concepts contained in the pages, and studied the publications intensely. Rolandi and Tianji Zhao have developed a form of engagement at Bernard Controls that exercises a light touch—never openly directing employees to make artwork, but instead making themselves available as a resource for those who are interested. After eighteen months of casual discussion, Zhao Haibo showed Rolandi and Tianji Zhao an abstract painting that he created on the lid of an industrial paint bucket. Zhao Haibo discussed his interest in the painting process and a desire to affect a materiality by creating protrusions using industrial spray paint. From there, the creative engagement between the three began in earnest and Zhao Haibo expanded his visual experiments to include photography and video using his cell phone. This luxury of extended time in SSRI and the LIVE/WORK project is highly unconventional inside a commercial factory. This ability to have sustained engagement in the workplace affords more organic interactions and the opportunity to forge deeper ties between artists and employees. SSRI’s artistic practice aims to blur categories and definitions—worker/management, worker/artists, home/work, art/life, etc., etc.—to arrive at a condition where the “rules of engagement are invented and negotiated all the time.” SSRI explains, “In a tangible and relational space, this small and humble moment [of physical encounter between artists and people] is very fragile but extremely precious, and it possesses unlimited potentialities.” Arrow Factory’s working method also aims to manifest subtle and ambiguous happenstances. On this fifth collaboration between SSRI and Arrow Factory, there is an acknowledgement that the process for realizing these unique projects is complex and nuanced, an organic layering that builds up over time. For Burn, the installation centers on Zhao Haibo’s photograph, developed through his relationship with Rolandi and Tianji Zhao. Arrow Factory’s subsequent interactions with SSRI evolves these ideas further into an installation for the street-side window display. The multitude of exchanges between Zhao Haibo, SSRI and Arrow Factory all converge together as a single creative gesture. SSRI’s expansive practice moves seamlessly from the artist’s studio to a company’s production line and beyond, escorting the slow smoldering path of Zhao Haibo’s Burn from a farm, to an urban factory, to Arrow Factory.